May’s works focus on creativity, expressions and accessibility. She currently leads creative music and vocal workshops for VIBE Arts, at her home studio, and at various locations across Toronto. She believes that everybody can sing and has a beautiful voice. Working with under-served communities, she strives to minimize barriers – especially social and financial – for everyone to learn, create, and enjoy music. 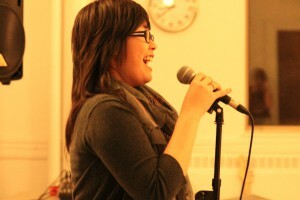 She has worked with newcomers, youth, children, as well as adults who have never taken music lessons. In 2014, May started a community event initiative named Community Creative Jam (CCJAM), to promote emerging artists and connect the public with local artists. As an active member in the community, she is on the programming committee of North York Arts and a Youth4Music ambassador. May has been singing and writing songs since 2004. In Malaysia, May studied contemporary and pop music at several notable schools: LeeWeiSong School of Music and MK Edutainment. She has joined multiple singing-songwriting contests and performance collectives. Intermedia artist Marc Couroux was her significant professor opening up her creative exploration in sound art. Have a look with her artistic philosophy and click on the tabs above to get a sense of what she is up to.